The Hamburg Senate continues to block any just solution to the Libyan war refugees "Lampedusa in Hamburg"
What is morally wrong cannot be politically correct. The Hamburg Senate continues to block any just solution to the Libyan war refugees "Lampedusa in Hamburg". "We hope for your solidarity" – This call, by the group "Lampedusa in Hamburg" was addressed towards the public in May 2013. People listened, understood and engaged. For almost half a year "Lampedusa in Hamburg" is on the road and thousands of people support their demand for the right of residence. The Senate ignores the voices calling for justice and humanity. After the St. Pauli Church proclaimed an “African Summer” providing accommodation for 80 "Lampedusas", the Hamburg Senate is now preparing a German Winter. Together with the group "Lampedusa in Hamburg" the supporting parties are calling for everyone showing solidarity, to come together again. Great demonstration - Recognition of the group "Lampedusa in Hamburg" now! For months, the 350 people of the group "Lampedusa in Hamburg" are living in a situation that truly is a non-ending nightmare since the outbreak of the war in Libya and the NATO air strikes - the horror of war, the fatal journey across the Mediterranean and their lawlessness, organized by the EU. To "protect the civilian population" NATO bombed Libya in nearly 10,000 attacks. Italy examined the cases of people who escaped the war, issued individual refugee protection to all of those concerned, declared itself unable to implement this protection and drove the war refugees out of the country towards Northern Europe. The need for war survivors to rebuild their lives after all their losses is blocked by the governments of the countries that preach democracy and human rights all over the world. the main thing is that the Dublin II system is being implemented. It is painful, after we were able to stabilize our lives in Libya to have to fight again for survival - in countries that call themselves major democracies"(Lampedusa in Hamburg). 15th of April - closure of the winter emergency program - The city of Hamburg throws more than 700 African refugees out on the road. 1st – 5th May - the Libyan war refugees bring their situation at the Protestant Church day in the public. The Nordkirche confirms to assist through humanitarian assistance. 21st of May - police forces (from the district office of Central-Hamburg?) prevent the construction of a tent camp. For over a month the “Lampedusas” are already sleeping in the cold and an in the rain under bridges, in doorways, parks, etc. 22nd of May – Construction of the permanent vigil at Hamburgs central station and short-term occupation of the Hamburg City Hall by " Lampedusa in Hamburg," in order to achieve that they can talk to the Senate and the Mayor. They were being comforted. 1st of June - negotiations on an accommodation of refugees between the Nordkirche and the SPD Senate fail. The church declared that they would not get involved in the establishment of a deportation camp. June - the protest is experiencing international media attention. In the city people from grassroots groups like from churches, mosques, local immigrant communities are organizing emergency relief in the form of temporary beds, food, clothing, medical care and courses on German language. Germany, after consultation with the Federal Ministry of the Interior. 14th of July - "We want our lives back " - through an exhibition, the African refugees living in Hamburg's St. Pauli Church for six weeks are drawing attention to their situation. 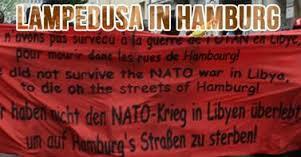 18th of June - " Lampedusa in Hamburg" demonstrates in front of the French Consulate. France was the first country in the EU that went to war against Libya. 07th of July - " Lampedusa in Hamburg " is supported by the unions Verdi and GEW. The refugees enter the union. 17th of July - 3,000 people go out on the streets for a political solution and the right of residence of Libyan refugees. August/September - more and more voices are calling for a political solution and the recognition of refugees in Hamburg. School classes visit the protest tent and " Lampedusa in Hamburg" is invited to schools. The Human Rights Commissioner of the Federal Government, Markus Loening, the meets the "Lampedusa in Hamburg" group and declares that the Hamburg Senate should find a solution for those concerned . The Hamburg Senate reacts with rejection. Negotiations initiated by the Nordkirche prove to be pseudo-debate. The Senate ignores the actual situation of refugees in Italy and refuses any discussion about it. The Nordekirche declares their intention to continue the humanitarian aid. The Senate denied the allowance to do the preparation needed for the sleeping-containers by the St. Pauli Church. On the 11th of September, - the first Wednesday-protest starting from the protest tent going to the city hall. This protest now takes place every Wednesday from 16:30 on. "We are very grateful for the understanding of the population of Hamburg and the great support that we experience daily. This gives us the strength to get up again and again in our desperate situation and fight for our rights. We cannot wait any longer; the situation threatens our health and our lives. The situation makes us sick, the cold weather makes it worse. We suffer from the uncertainty and the enforced inactivity; it's very stressful for us. We have chosen to provide representative requests for humanitarian residence together with our lawyers, so that the Senate cannot continue to shirk its responsibility. On September 16th the Senate declared that in the application it could not find a reason for a stay of the group "Lampedusa in Hamburg". It is shameful but not surprising, that the war refugees and the numerous supporters are being mocked by the ignorance of power. The church tries to continue the humanitarian aid and plans to set up containers for the winter time on church grounds. The Senate refused to grant the necessary building permit. been run through an asylum procedure in Italy and their refugee status was recognized. The Senate wants everyone to run through the procedure again, one by one but already explained, that the absolute majority of the applications for asylum will be rejected. What is this cynicism for? To the circumstances of the war refugees "Lampedusa in Hamburg"
For over 5 months they live in a provisional arrangement which they organized together with numerous voluntary helpers. A makeshift supply with clothes, food and beds made possible with help from the Hamburg population. Libya, and workers are needed in Hamburg, many of them had received job offers. However, they do not receive a work permit. It is admirable how the group continues to stand together under the extreme conditions, and those affected still being mutually supportive. Behind every person there are relatives, families and wards that are cut off from the support since the war in Libya. It is infuriating to see how the Senate is trying to play for time in order to frustrate the people to plunge into depression and aggression and is forcing a slow process of destruction of individuals. Soon the third winter after the war in Libya is to begin and the victims are still the outlaws, the persecuted and the disenfranchised. Come along! We need you! All of those who know the traumatic story of the workers from Libya who have come via Italy to Hamburg, stand beside the group and share the demand for grant of a safe residence permit. There is no other way for "Lampedusa in Hamburg" than to continue fighting for their rights in Hamburg. Many caring people feel that the attitude of the Senate is inhumane and we are all ready to show the Senate the red card. We need you all on the streets in Hamburg at 2nd of November.and on Rathausmarkt at 6th of November. We want the Senate to know that they cannot treat people like dirt - neither the refugees nor the people who have shown active solidarity for months. Let’s take back our stolen dignity by giving 350 war survivors who continue to fight for survival back their right in one of Europe’s richest cities. We demand the recognition of the group "Lampedusa in Hamburg" now! It is easy for the Hamburg government to find a solution, but they prefer sending out signs of inhumanity. Solidarity is the basis of a just and peaceful society. Solidarity among the oppressed is the only answer to the attacks of the oppressors. We call upon you: pupils, university students and teachers, especially in schools defense campaigns are being held against the deportation of schoolmates and the campaign for Fabiola and her family have set a strong sign. Keep on; you are shaping the future of society. We call upon you: religious communities of churches and mosques, your commitment to helping people in need is of great importance in the society, if it is continued consistently and without fear of cold power. For months, you are a great support for "Lampedusa in Hamburg," continue to follow your heart and God's word. side of those who have come to you, is giving hope to build a really supportive community. We call upon you: workers who produce all the wealth but have almost nothing of it in their own hands, the separation is not between us who work to survive, but between us and those who benefit from playing us off against each other. We call upon you: people of this city, this country, this world, for a departure from the soulless, technocratic organization of society for solidarity among ourselves as the basis for our actions. Donate using the keyword "Hamburg" to the account below:Förderverein Karawane e. V.